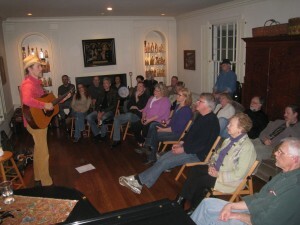 Stone House Concerts are intimate, unplugged, live musical experiences held in the sunken hearth room of an elegant early 20th century stone house located in the Palmer Park neighborhood of Detroit, Michigan. The owners of this home and concert hosts are Sigrid Christiansen and Richard Levey. All year round the Stone House Concerts feature exceptional singer/songwriters from hometown luminaries to nationally known touring artists. Food and drinks are served before each concert begins and at the break. Here you will find the perfect setting for an up close, acoustic performance with the chance to meet the performers and relax with friends. Concert goers are warmly welcomed and made to feel right at home!